New Zealand v South Africa – the ultimate preview – impress your friends! New Zealand v South Africa is one of the biggest rivalries in rugby. Here is a statistical look at the match..
New Zealand: Mils Muliaina, Cory Jane, Conrad Smith, Ma’a Nonu, Zac Guildford, Dan Carter, Jimmy Cowan, Adam Thomson, Richie McCaw (captain), Jerome Kaino, Ali Williams, Sam Whitelock, Ben Franks, Andrew Hore, Wyatt Crockett. Substitutes: Corey Flynn, John Afoa, Jarrad Hoeata, Liam Messam, Piri Weepu, Colin Slade, Sonny Bill Williams. South Africa: Patrick Lambie, Bjorn Basson, Adi Jacobs, Juan de Jongh, Lwazi Mvovo, Morne Steyn, Ruan Pienaar, Danie Roussow, Jean Deysel, Deon Stegmann, Alistair Hargreaves, Gerhard Mostert, Werner Kruger, John Smit (captain), Dean Greyling. Substitutes: Chiliboy Ralepelle, C.J. van der Linde, Ryan Kankowski, Ashley Johnson, Charl McLeod, Wynand Olivier, Odwa Ndungane. •	In 15 seasons of Tri Nations Rugby, the All Blacks have compiled a record of 13 wins and two defeats in the matches that opened their season. They are 8-0 when their first match takes place in front of a home crowd and have won their last five openers home and away. •	The All Blacks have won their last seven TN matches and are one shy of the record winning streak in the competition. The Kiwis posted eight match winning streaks in 1996-1997 and 2005-2006. •	They have also won 12 of their last 15. Matches against South Africa account for all of their defeats in that span. •	New Zealand’s last Tri Nations defeat dates back to 12 September 2009, when they lost 32-29 at home against South Africa. In that match, Dan CARTER became the competition’s all-time top scorer surpassing the mark of 328 of fellow All Black Fly-half Andrew MEHRTENS, who was born in Durban, South Africa. •	Dan CARTER’s 1,194 career points rank one behind Jonny WILKINSON’s all-time record of 1,195. CARTER has needed 80 Test matches to reach his current total, whereas WILKINSON has needed 91. •	If New Zealand win the TN this year they will have won it 10 times, twice Australia’s (2) and South Africa’s (3) overall wins put together. •	New Zealand have scored at least one try in their last 33 TN matches, a streak that is already a record and started after a 23-18 defeat at Australia on 7 Aug 2004. They have also scored multiple tries in their last eight TN matches, also a record for the competition. •	If Brad THORN plays he will pass Frank BUNCE and become the second oldest All Black ever to represent New Zealand. THORN was born on 3 February 1975 and will be 36 years and 177 days on Saturday. BUNCE was 35 years and 297 days when played his last Test against England on 6 Dec 1997. •	THORN will not threaten the oldest All Black ever, Ned HUGHES, who played his last Test aged 40 years and 123 days against South Africa on 27 August 1921. •	The All Blacks have scored 28 or more in seven of their last eight TN Tests against South Africa on home soil starting in 2005. •	If Dan CARTER scores 25 points he will have scored 246 against RSA. World record against any nation is his 245 vs Australia. •	In South Africa’s opener, front rowers John SMIT and Chiliboy RALEPELLE accounted for the Springboks’ only tries. It was the first time in TN history that South African front rowers produced multiple tries in a match. •	By losing 39-20 against Australia last Saturday, the Springboks became the first side in Tri Nations history to concede at least 20 points in 10 successive Tri Nations encounters. •	South Africa lost their 5th test from five appearances at ANZ Stadium, Sydney last weekend, which is their worst record at any stadium in the world. A similar result this weekend will equal the Sydney record. Currently they are 0 from 4 at Westpac Stadium, Wellington. •	John SMIT became the oldest Springbok, at 33 years 111 days, to score a try in the TN when he crossed in the second half against Australia in Sydney, passing Percy Montgomery who scored at the same venue against Australia in 2006 aged 32 years and 143 days. •	Last week Australia scored five tries against the Springboks for the fourth time. Only four times in 396 tests and 120 years had they conceded more. •	The All Blacks lost their first ever Tri Nations match at Westpac Stadium (24-23 against Australia in August 2000), but have won each of the next six TN matches they hosted at this venue. •	Mils MULIAINA has won eight tests at Westpac Stadium, the most by an All Black. His only Test loss in Wellington was his debut off the bench in 2003 against England. •	The All Blacks have only lost once to the Springboks in Wellington since 1981, a 13-3 loss at the old Athletic Park Ground in 1998, winning all four Tests played at Westpac Stadium since 2002. •	These two teams will both play 2011 World Cup group stage matches at this venue. New Zealand host Canada at this venue in their final Group A match (2 October), whereas the Springboks take on Wales (11 September) and Fiji (17 September) at this stadium in their opening two Group D matches..
•	New Zealand have collected nine wins and zero defeats in TN matches in which Piri WEEPU has started at Scrum-half. No other player in the competition has been as successful when looking at starts made in that position. •	South Africa fielded three debutants in their first TN match (props Dean GREYLING and Werner KRUGER and back rower Ashley JOHNSON) and could have set a record with their fourth, but Charl McLEOD was the only Springbok that remained on the bench last Saturday. The three Test match debutants equalled a competition record. •	The most Test debutants fielded in a Tri Nations campaign is six by South Africa in 2006. 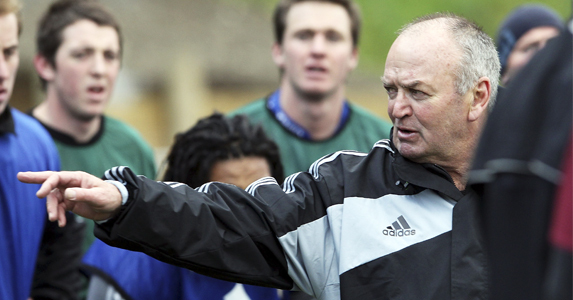 By bringing in McLEOD and Gerhard MOSTERT the Boks can increase their total for the 2011 TN to five. •	Ma’a NONU and Conrad SMITH will start a Test together for the 28th time – equalling the New Zealand record currently held by Walter LITTLE and Frank BUNCE. The international record for a starting Centre combination is held by Jeremy GUSCOTT and Will CARLING who started 44 Test matches together. •	Richie McCAW has won 51 of his 58 Tests as a captain. His 51 wins captaining his side are tied with the all-time record by John SMIT, the Springbok skipper that will provide the opposition on Saturday. •	The record for playing in most TN victories over South Africa is 13 and is shared by New Zealand’s Justin MARSHALL, Tana UMAGA and Mils MULIAINA. The latter can set a new record if he plays and wins on Saturday. All Blacks captain Richie McCAW can pick up his 13th TN victory over the Boks.